As an undergraduate senior thesis, this research study identified and ranked the community colleges in the United States to determine institutions with the greatest potential to partner with Wilmington University, a private non-profit university in Delaware. Using data from the Integrated Postsecondary Education Data System (IPEDS), these institutions were ranked based on a weighted average of the institution’s enrollment potential, program disciplinary alignment, size of online student population, and geographic region. An in-depth examination was conducted of the 10 highest-ranking institutions. This project was presented at the Mary Baldwin University 2015 Capstone Festival. As a Public Administration Fellow at the Institute for Public Administration (IPA) within the University of Delaware, I contributed to a Mobility Management project for the Delaware Transit Corporation. 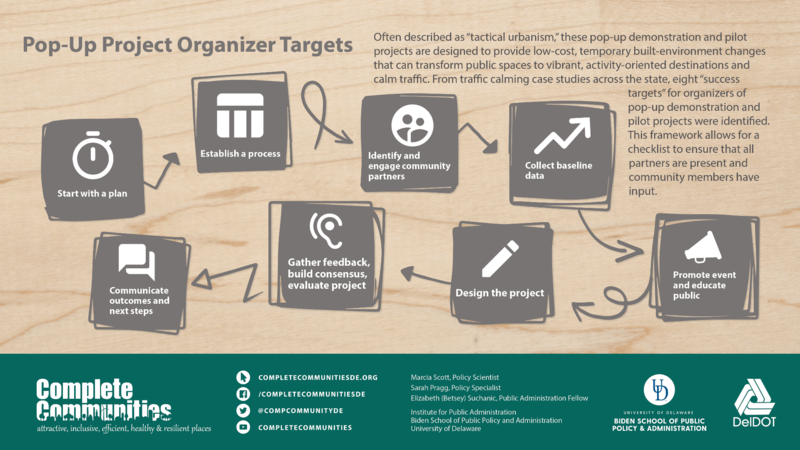 Contributions included: designing outreach strategy for four transportation disadvantaged populations, identifying opportunities for promotion and community partners, and designing external engagement tools and materials. Outreach Strategy was published in “Public Outreach and Engagement Plan To Develop a Coordinated Public Transit—Human-Services Transportation Plan for Delaware” Report (January 2017). Learn more about Mobility in Motion here. Recruited and organized a team of eleven interns that provided 700+ hours in the planning and implementation of a conference surrounding topics related to social innovation with local communities in partnership with the Staunton Creative Community Fund and the City of Staunton. Following the role as Intern Coordinator, organized a series of community conversations, including the “Bach n’ Roll Roundtable” around local music and a Maker Camp that incorporated STEM and entrepreneurship education for middle school students. “Nurturing the Entrepreneurial Spirit through Creative Culture”, Virginia Economic Developers Association (September 2015). “Innovate LIVE! : A City-University Partnership” McDonough Leadership Conference at Marietta College (April 2016). Learn more about Innovate LIVE at innovatelive.org. As the Director of Capital at the Staunton Creative Community Fund, I coordinating the local investing network, Invest Local. I supported the program by planning quarterly meet-and-greets for local investors and entrepreneurs, leading a self-directed IRA training, and conducting research on local crowdfunding and investing models. As the Summer 2018 Philadelphia Program Intern for the Knight Foundation, I supported the Reimagining the Civic Commons learning network with the creation of storytelling materials for grantees. These resources included a presentation, one-pagers, and examples of exceptional storytelling to illustrate the impact of these civic investments. To further support the work of Reimagining the Civic Commons, I designed a study-tour guide book to allow for targeted note taking for those visiting Philadelphia’s civic assets and for when Philadelphia organizers visit other partner cities. Affiliated with Open Data Delaware and Code for America’s national brigade network, I founded a weekly civic technology group in Newark, DE. Newark Codes serves as a community gathering for open data advocacy, technical education, and civic projects by harnessing software. Meeting each week at the Newark Free Library and sponsored by the University of Delaware’s Institute for Public Administration, Along with co-founder Eli Turkel, facilitate this gathering of volunteer developers, conduct projects, welcome new members to Delaware’s civic technology community, host speakers, and hold trainings. Learn more from our meet-up page and press in Technical.ly Delaware. As part of the 2018 Open Data Challenge, hosted by Open Data Delaware, a working prototype of MobiliDE was pitched as a user-center Paratransit Portal to make Delaware more accessible. The team was made of Randy McNeil, Eli Turkel, and Betsey Suchanic. MobiliDE created an easy to use reservation system and used open data to showcase alternatives transit and mobility options for those who qualify for paratransit. Individual contributions included the front end design, specifically the branding and wireframe mock-up. MobiliDE received an Ideation award from the Open Data Challenge. Read more about the Open Data Challenge in Technically Delaware. As a Public Administration Fellow for the Institute for Public Administration, I contributed to the Delaware Complete Communities Toolbox. Funded by the Delaware Department of Transportation, these tools serve as urban planning resources for local governments across the state. To supplement the toolbox, both online and in print, I created and designed a line of 75+ urban planning trading cards to display at events. The terms and definitions, also designed as social media posts and presentation deck slides, provide accessible, short definitions to reduce the barrier of complex language and jargon to citizen planners. The entire glossary is available on the Complete Communities site. As the Director of Capital at the Staunton Creative Community Fund, the role included designing and updating the 8-Week Business Planning curriculum. Responsibilities included: developing cash flow and income statement worksheets, target market exercises, and contributing to a sample business plan exemplar. The 8-Week course was also designed in a modular format where instruction type and delivery could vary. As a Public Administration Fellow at University of Delaware’s Institute for Public Administration, I contributed content to the Complete Communities of Delaware Toolbox, an urban planning resource for local governments. As part of my work, I completed several pop-up, traffic calming case studies across the state. To illustrate these cases and the findings, I developed a Stories of Delaware Complete Communities video series. To further illustrate the work, I developed a summary GIS Story Map, infographic series, and poster. This research was presented at the 2018 Delaware APA (American Planning Association) Regional Conference, the 2018 Delaware Institute for Local Government Leaders, and the 2019 Transportation Research Conference. Being in the leadership of the Open Data Delaware, a Code for America brigade, I support and contribute to Delaware’s civic technology community. Open Data Delaware advocates for government transparency, support stechnical education, and contributes to civic technology projects. I support the organization in their communication efforts (including their rebrand), facilitating events and partnerships locally and nationally, and contributing to user experience design on various civic technology projects. Learn more about our Newark Codes meet-up and our Delaware School Choice Sherpa projects. As an organizer of Open Data Delaware and a facilitator of Newark Codes, I have played a role in organizing a group of volunteer software developers and in the user experience design of an online school choice search portal. The Delaware School Choice Sherpa aggregates state education open data into school profiles and provides parents with easy-to-understand instructions on the school choice process. I have played a significant role in the ideation, development of user experience design, visual design of all graphics, and in project management. Created as a theoretical social enterprise model, ReLAUNCH Ventures is a for-profit, employment-focused, social enterprise owned by the ReLAUNCH Center. All profits from ReLAUNCH Ventures are invested in the re-entry mission of the ReLAUNCH Center. ReLAUNCH Ventures consists of three businesses, the Culinary Center, the Agricultural Center, and the Trades and Manufacturing Center. Each of these three businesses employ ReLAUNCH Center clients and provide entrepreneurship education and business incubation to interested clients. Research business models included food hub models, incubator kitchen models, small scale urban farming models, and makerspace models. As the Director of Capital at the Staunton Creative Community Fund, I managed the Virginia Individual Development Accounts (VIDA) program. This financial stability partnership with the Virginia Department of Housing and Community Development, under the federal Assets for Independence program, provides a match-savings program for low-income individuals. This program provided financial literacy training and business development, home-ownership, and education asset-specific training. and matched savings with grant funding at an 8-to-1 rate. In my role, I provided financial literacy training, business development training, community outreach, and designed a home-ownership match-savings employee benefit program. The Make it Count campaign is the first student-led initiative of the Biden Institute for Domestic Policy at the University of Delaware. The Make it Count campaign seeks to raise student level of civic engagement within students at the University of Delaware, with a particular focus on voter registration and voter engagement at the state and local level. A partnership with Democracy Works and their TurboVote service allowed students to register with Turbovote and receive notifications for upcoming elections. As the Public Relations Committee Leader, I designed all visual collateral and led a group of five students in launching a communication campaign to introduce Make it Count to the University of Delaware community. Activities included the creation of an overarching brand, social media content and strategy, print material design, and event promotion. Outcomes for the first three months included 1,000+ turbovote registrations. Learn more on the Biden Institute webpage.